I’ve seen this movie before,folks,and it doesn’t end well for anyone. It’s been reported this week that NBC has plans to hand the Tonight Show over to Jimmy Fallon in 2014, four years after Jay Leno was reinstated as host after their experiment with Conan O’Brien as host. The show would move from Burbank to New York if Fallon is given the job as host. Though it isn’t official nor is NBC giving word on any rumors, many speculate that NBC is hoping to get a younger host in place of Leno,62,while they still have a chance to keep a younger audience. Fallon, 38, has that young audience in his 12:30 time slot. I,on the other hand, am astonished that we’re going through this again. First in the 1990s when Johnny Carson retired and the show was given to Leno before David Letterman could ever get a chance at it. Then Leno said the show would be given to O’Brien following his “retirement”. 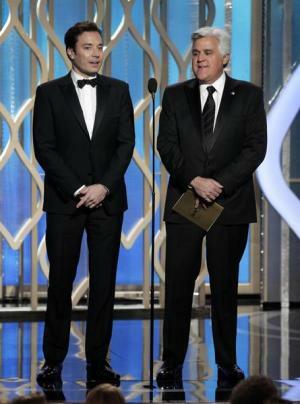 Then O’Brien quits in lieu of moving his Tonight Show to 12:05am and Leno once again took over hosting duties. Now we’re hearing he’ll be gone again? This sounds all bad. Look, NBC really has a few things going for it at the moment, NFL football and being the leader in late night. While having Fallon host the Tonight Show sometime down the road might be the right move to make,it isn’t now. Leno’s Tonight Show is leading the ratings wars, beating CBS’ Late Show with David Letterman (3.5 million viewers for Leno compared to 3.1 million for Letterman) and NBC pushing Leno out the door (again) would be a big mistake. I’m not the biggest fan of Leno following what happened the last time but I am a guy who knows that if you don’t learn from history you are doomed to repeat it. Big time. NBC has already made a mess of things with the Today show, they need to leave well enough alone here. The only way I would make a move with Leno for Fallon is if Leno’s ratings dropped big time in the next couple years. That’s a legitimate reason to make that move if you ask me. I hope that if this move really is in place anytime soon that they rethink it. They might,but given their recent history,they might not and it will get ugly.